Every six months, Troop 50 Scouts conduct elections for its senior patrol leader and patrol leaders, who along with the assistant senior patrol leader selected by the new SPL, form the troop's Patrol Leaders' Council, or PLC. This past Monday, the troop saw one candidate for SPL, William, run uncontested for the troop's highest office. After the troop affirmed his selection, he selected John as his assistant. Both will serve in their leadership positions through the troop's spring 2014 term. senior patrol leader William (right) and assistant senior patrol leader John (center). Following the SPL and ASPL selections, the troop then considered leadership in its two reorganized patrols. 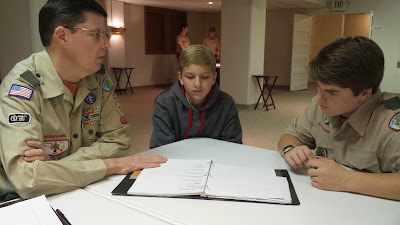 With many of the older Scouts still pondering their plans to serve as patrol leaders, the troop decided to elect assistant patrol leaders first and revisit the patrol leader selection later. Several of the troop's newer Scouts expressed an interest in running for these two assistant patrol leader positions, and after an election by the troop, Andy and Louie were selected as assistant patrol leaders. They, along with mentoring help from junior assistant scoutmasters Jeffery and Jake, met with their new patrols to finalize new patrol names and to discuss ideas for new patrol flags. 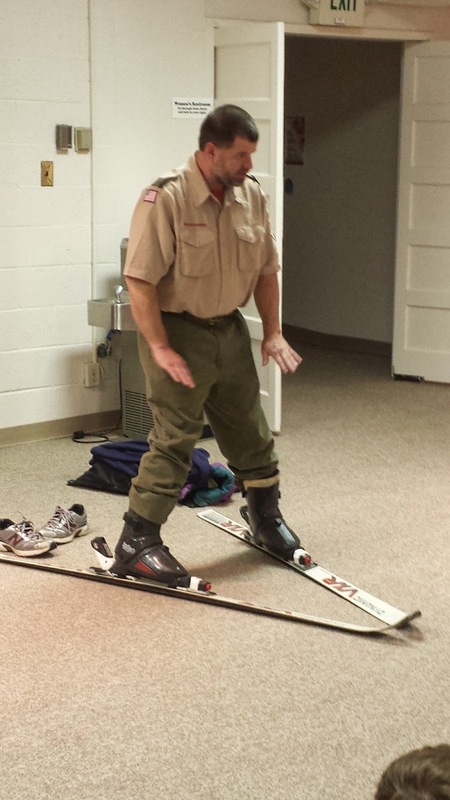 Scouts will use on the troop's upcoming ski trip. 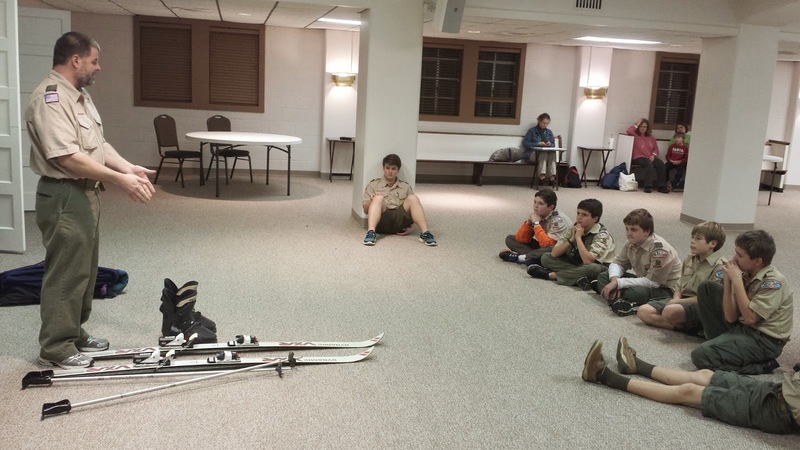 Assistant Scoutmaster J.P. Pendleton offered Scouts and leaders a primer on snow skiing in advance of the troop's January trip to Gatlinburg. He demonstrated the various pieces of skiing equipment those attending the trip can expect to use, and some basics on skiing technique and slope protocol. The troop will hold its year-end court of honor Monday, Dec. 16 at First Presbyterian Church, which will also include games and other Christmas party activities, induction of new troop leaders, and donated toys as a troop service project to benefit the Auburn Fire Department's toy-collection drive. The court of honor will be the troop's last gathering of 2013 until meetings resume in early January 2014.